Most Popular Vacation Rental Building on Clearwater Beach! 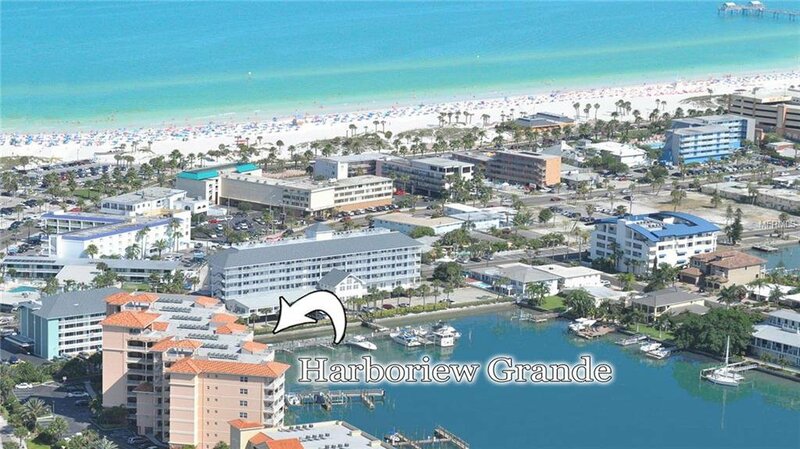 Situated in the heart of everything that makes Clearwater Beach famous, Harborview Grande is within feet of numerous restaurants, vendors, activities and shops. Most importantly it is only 1.5 blocks to the soft, alluring sands of Clearwater Beach. While the location of this condo is ideal, the interior of this unit boasts an incredibly spaciousness floor plan with high ceilings, a 29 ft. waterfront balcony, a spacious master suite and walk-in closet, tray ceilings and hurricane-rated windows and sliders. Best of all, owning a unit in Harborview Grande means that you can rent out your unit when you are not using it. Because weekly rentals are allowed, you can capitalize on the high demand these units produce as a vacation rental property. (And yes, this unit comes with rentals already in place, so you start making money the day you purchase the property.) Other features include an assigned under-building parking space (#6), an outdoor heated pool and spa, a club room with a wet bar and pool table. Additionally, Harborview Grande is also pet friendly, with a maximum of two pets allowed with a combined weight of 25 lbs. Come see for yourself, what makes Harborview Grande so amazing. Whether it is a beautiful sunrise or a sunset glow captured from your private balcony, or it’s spotting dolphins or manatees swimming just outside your unit, you are sure to make memories that last a lifetime in your new Harborview Grande unit. Listing courtesy of SAND KEY REALTY. Selling Office: SAND KEY REALTY.